While I may share occasional closet details, outfit posts just aren't my thing but I have a stylish friend who feels differently. Rena was first introduced on the blog dressed in an LBD, relaxing in her living room, enjoying Pierre Hermé macarons. Besides knowing how to live luxuriously, the girl is quite stylish and loves fashion. She even has her own ostrich Hermés Birkin bag. Rena is an Asian Pullip doll which is a line similar to Blythe fashion dolls. She fits certain styles of Barbie clothing but she finds modern Barbie's fashions a little trashy so she prefers vintage. Isn't her Vespa just fab? Hahaha this is too cute! Esp. her little moped! White boots - the most mod thing ever. I used to LOVE playing with my aunt's barbies. She had the 60s clothes and accessories and I agree they were much classier than today's barbie stuff. I love Rena's vintage clothes!! She looks so chic! Thanks for your comment, love your blog! oh i think she is just fabulous! Adore! I am all about the mod look. And vintage Vespas? Be still my heart! Most fab doll i've seen that's for sure! I am in love. Rena looks stunning. My Penelope needs a Vespa - also a wardrobe change haha. She is absolutely fabulous! Love the vespa! I wish I looked that stylish riding a baby blue Vespa! Oh my goodness, this is one of the cutest things I've seen! She is so stylish and adorable! This is so cute! Love the vespa! She is SO styling and love her on the Vespa! Hahaha! So cute! I like the way she rolls...Vespa and all!! I think vintage Barbie was also prettier besides having nicer clothes/accessories. Thanks! I love that Vespa! I will def. let you know when I do. Thanks Tiffany! The mod look is always cool! Thanks Marcela! I'll be to check it out! Thanks Bessie! You do so need to get your fashion doll! It's fun! Thanks! She picks her own clothes. Thanks! She rolls in style haha! Damn. I need to recreate this outfit and copy the haircut. Thanks so much for your sweet comment today! Your blog is lovely! I think she is fab! 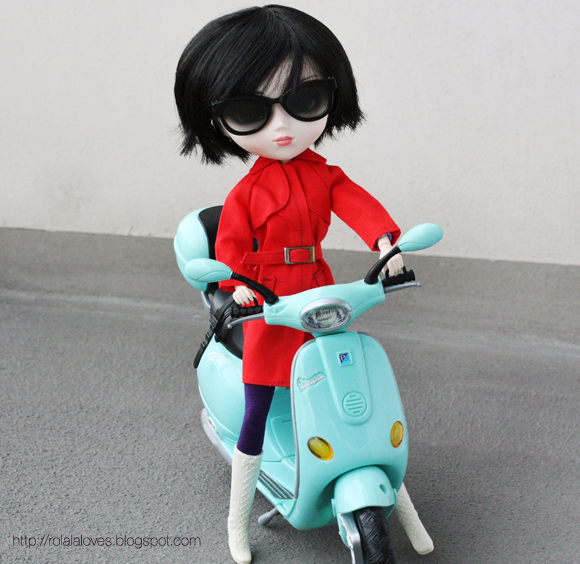 Rena is so stylish and love her on the Vespa. She is amazing. gosh, your doll is way more fashionable than me! love it so much! THAT was one of the things that attracted me to your blog! I think it is SO fabulous! Rolala, I would LOVE to feature you on my blog! Can you pick several "Rena" pics and do a short write up so I can showcase her(your blog) next Thursday (2/16)? I think it's just fabulous and it would fit in with a post I'll be showcasing Wednesday. Let me know! Love your blog! I´m following you now! Have a look on my blog! omg I am in love with Rena! Do you really have that little aqua vespa for her? I love her mod styling, her haircut, everything about her! But then of course I'm slightly blythe obsessed and love all of this stuff. Have a wonderful weekend! These dolls must be a very expensive hobby - the amount of detailing that goes into them and their outfits is amazing. OMG she's the cutest doll i've ever seen..
hello dear, this is such a fab doll, very different than any barbie and this is why i like it, it has a parisienne chic touch to it with its vintage style and vespa. She is one stylish lady ;) Love her red coat! What a cool lady we have here! oh my gosh she's so sweet! and that vespa, adore!